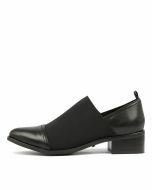 Ideal for work to weekend wear, this man-tailored inspired design will keep your look smart and sophisticated. 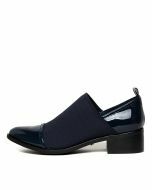 Set upon a comfortable mid-block heel, this pair is rendered in a glossy patent leather upper with an elasticised opening which allows for a secure and comfortable fit. Complete the look by styling with tailored pants and a cable knit jumper. .